**NEXT STABLE VISIT** - Saturday 20th April 2019, meet at 9.30, all welcome, message for details. DERBYSHIRE RACING is a successful horse racing syndicate based in South Derbyshire that offers affordable and genuine racehorse ownership. Established in 2005, Derbyshire Racing currently have 4 horses in training with JOHN MACKIE RACING, who has trained an impressive 41 winners for us to date and provided our owners with a lifetime of unforgetable racing memories. We also have a breeding programme in place, with 2 of our current horses in training being bred out of our ex-race mares. 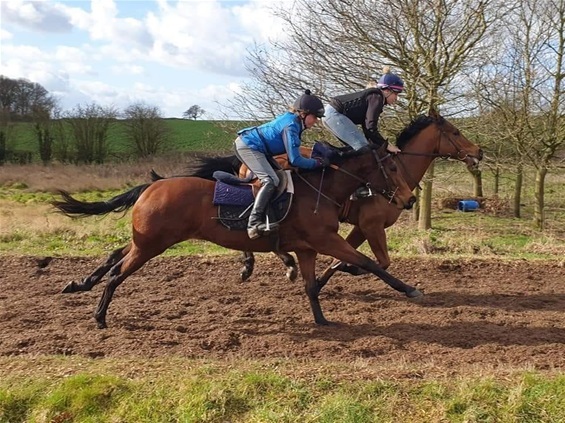 Our syndicate offers affordable shares of 2.5% upwards in our horses and our monthly fees, which include all training and racing expenses, are one of the most competitive you will find in the UK. Derbyshire Racing owners and their guests are always offered free and discounted Owners & Trainers Badges to see their horse run at the racecourse, receive their full percentage of prizemoney won, are given regular text and email news updates and are enjoy exclusive membership of our Derbyshire Racing Owners Forum. Every 4 to 6 weeks a Saturday morning Stable Visit is arranged that allows all of our owners the opportunity to see the Derbyshire Racing horses working on the gallops, discuss racing plans and to meet up with fellow owners. Its always a popular morning and allows owners to get close to the horses. Experience the thrill and involvement of genuine racehorse ownership from just £50 a month with the option to either purchase your share or in some cases lease it over a 12 month period for no upfront fee. If you may interested in getting involved as an owner, require further information about Derbyshire Racing or to arrange a stable visit to view the horses and meet the team at John Mackie Racing's Barton Hall Stables near Church Broughton, South Derbyshire then please do not hesitate to "Contact Us" – we would be delighted to hear from you.